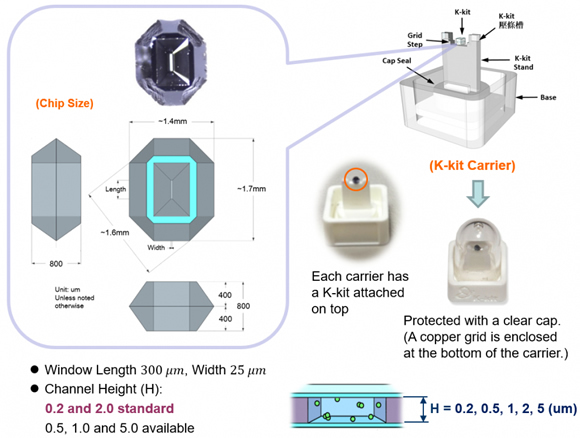 The carrier is designed as a protective container during storage and shipment. It also serves as sample preparation facilitator, incorporating the hand tools available from us (see below). 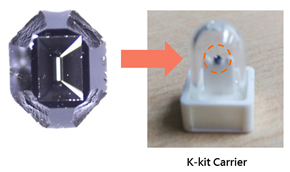 Thus, the K-kit stays on the carrier plate for the entire sample preparation protocol until after the copper grid is attached. 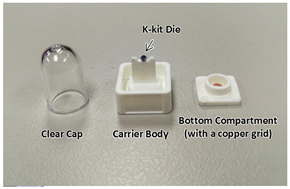 K-kit packaging includes a clear cap, a carrier with K-kit sitting on top of the plate and a bottom compartment housing a copper grid. First, leaving the clear cap in place to protect the K-kit, use a paper clip to push open the bottom compartment through the holes at the corners.